Men’s skin contains more collagen than women’s skin, which makes it tougher and 25% thicker. Thus, it’s important to use products designed specifically for men’s skin. While borrowing products from your girlfriend may be tempting, women’s skincare products won’t be as effective for men. Add these four products to your bathroom cabinet and you’ll have everything you need for happier, healthier skin. Cleansing the face is an important first step in any successful skincare routine. It will remove any dirt and toxins that have built up on your skin during the day and give you a clean and bright base. Massage cleanser in a circular motion after rinsing your face with warm water. Remove your cleanser with a splash of cold water to tighten your pores and encourage good circulation to the skin. 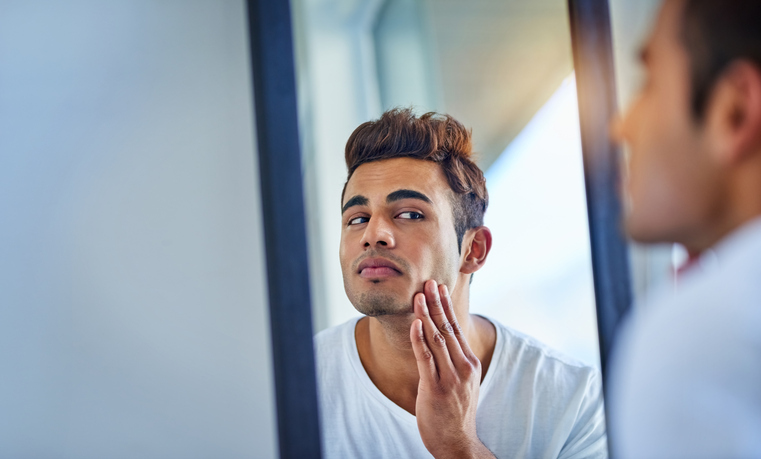 Men produce more sebum than women, which means their skin is more prone to clogged pores and breakouts. Get into the habit of cleansing your face morning and night to remove this oil, and keep your skin at its healthiest. Does your skin often look dull and tired? Then you need to invest in a good quality moisturizer. One of the biggest causes of tired skin is a lack of moisture; moisturizer will add vibrancy to your skin, and will also help to prevent the signs of aging. It can even keep those pesky wrinkles at bay! Use a high-quality men’s moisturizer like Camouflage Moisturizing Face Balm. Apply in small circles and pay particular attention to the deep wrinkles around your eyes and on your forehead. Top tip: Apply your moisturizer to skin that is still slightly damp after cleansing. This will help lock your natural moisture in and help your moisturizer work harder. 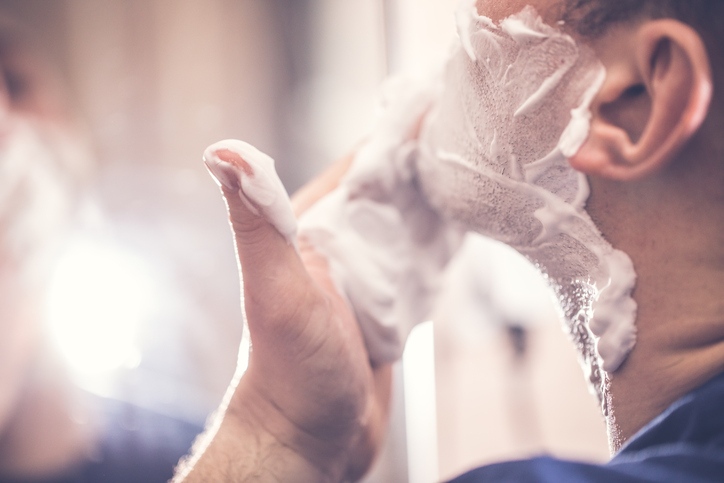 It’s impossible to get a perfectly smooth shave without a high-quality shaving cream, so it’s important to pick the right one. The right shaving cream will provide protection, make shaving faster and easier, and nourish your skin. We recommend using Camouflage Speed Shaving Cream, which lubricates and moisturizes skin with sweet almond and shea nuts. Apply shaving cream liberally before each shave. Brush it into the bristles of your beard and shave in the direction of your beard growth to protect your skin as much as possible. Finally, don’t forget to apply a liberal dose of aftershave like Camouflage After Shave Fluid at the end of your morning routine. Not only will this ensure that you smell great, it will also help to soothe and protect any skin that has been irritated by shaving, relieving the inevitable razor burn. Finding your own signature scent is important: wear your chosen aftershave every day and people will immediately know when you walk into a room. Smell is one of our most powerful senses: appeal to it by choosing the right aftershave that suits your nose as well as your skin. A final note: when it comes to male skincare, less is more. There’s no need to layer on too many products that might actually irritate your skin. If you can find the time to cleanse and moisturize your skin every day, and take care of your skin every time you shave you’ll have a healthy and refreshed-looking face in no time!